The Homestead lift replaced a T-Bar at Summit in 1980 and will now be operated by nearby Timberline Lodge. The Pacific Northwest’s oldest ski resort has a new owner from just up the road – Timberline Lodge. With its purchase of Summit Ski Area, Timberline parent RLK and Company brings together two of the five ski resorts that surround Oregon’s Mt. Hood. Family-owned Mt. Hood Meadows bought Cooper Spur Mountain Resort back in 2001 and Mt. Hood Ski Bowl is operated by a third local entity. Situated in Government Camp directly below Timberline’s Jeff Flood Express, Summit operates a 1980 Riblet double chair and sells lift tickets for just $35. “We are very pleased with the acquisition and plan to operate Summit Ski Area as a family oriented, affordable, friendly mountain resort,” noted Jeff Kohnstamm, President of Timberline in an afternoon press release. The long term possibilities of two ski resorts in such close proximity are intriguing. From bullwheel to bullwheel is just under a mile and there is already an unofficial ski trail between the two areas. Total vertical could theoretically reach 4,540 feet – far and away the longest in the Pacific Northwest. But even if the ski resorts never link by ski runs, they could by gondola. Timberline’s news release notes, “With Portland’s population growing rapidly and more people visiting Mt. Hood, Timberline also views Summit Ski Area as an opportunity to help address public transportation and parking needs while having a greater connectivity to Government Camp.” A gondola from Government Camp to Timberline would make a lot of sense because of challenges maintaining a road and parking lots above treeline. There was a gondola lift of sorts way back in the 1950s and RLK has in the past proposed a two stage version along a similar route. Lots going on today. This was smart on Timberline’s part. I’ve always wondered if Timberline and Mt. Hood Meadows would be able to cooperate Whistler-Blackcomb style by adding a gondola between the current lodges. The White River canyon between the two is pretty prone to mudflows/debris avalanches from glacial outbursts of the White river glacier. Any lift across the canyon would have to be built to be immune or withstand such events. I know the hwy 35 bridge across it has been rebuilt a couple of times in my memory. A 3S gondola like Peak to Peak would probably be the best option. I would love to see this, but the cost of a 3S gondola would probably be too high even if Meadows and Timberline pooled their resources. Also, I think that there would be more than a few lawsuits from Friends of Mt. Hood and other environmental groups who would try to claim that a gondola would disrupt sensitive habitats or be visually intrusive. 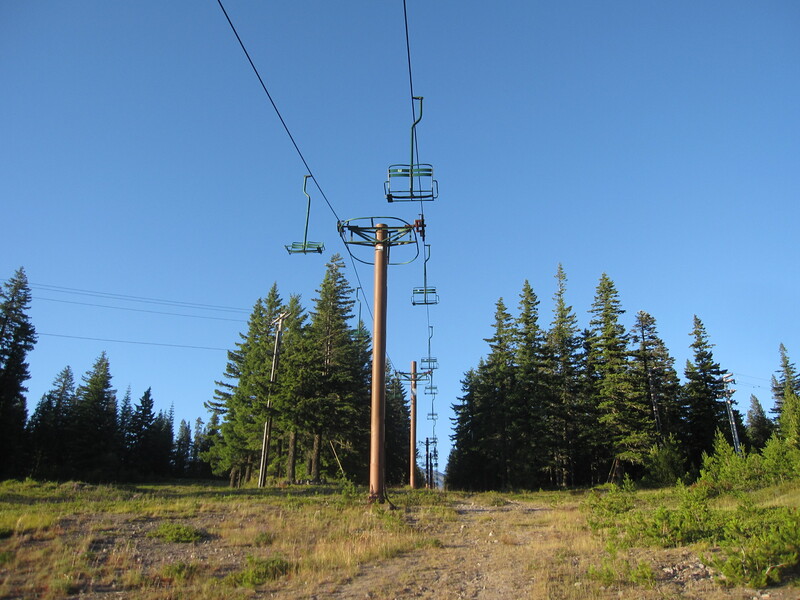 It took Timberline years to win the suit blocking the construction of their lift-served mountain bike park, a project of a much smaller scale than a gondola would be. It will be interesting to see what this does to traffic in Government Camp this coming winter. Weekend traffic on hwy 26/35 is already pretty awful, especially around major intersections with Timberline, Snow Bunny, etc. If Timberline chooses to use Summit as a satellite parking lot, either for a shuttle or gondola, I fear it will make traffic worse still. It wouldn’t surprise me if Timberline would try and build a new parking lot with gondola access across the highway next to the ODOT facility. The current Summit parking lot cannot accommodate the demand to ride the gondola if built at this location. Do you know if Timberline already owns that land / if it was included in the Summit purchase? Even if it wasn’t you make a good point, I doubt it would be terribly difficult for them to get permission/approval to use it for parking and a gondola. According to the USFS GIS Map, that section of land adjacent to the ODOT shelter is on USFS while the property adjacent to Summit Trail Rd and behind East Morrison is private.